Yet, even for Moore’s poem to ‘catch fire’ the way it did, some kind of explanation seems warranted. In fact, to say that Moore tapped into a powerful human current is, after all, to admit to the existence of a river for the current to flow through. Or is it an ocean? For the Santa Claus ‘Myth’ is one that has been percolating over the centuries throughout various cultures. Each region had its own take on who and what Santa Claus was, and yet there were common threads that ran through them all. Prior to America’s application of business acumen, none of them had a Santa Claus that was particularly magical, per se. In point of fact, the Santa Claus of the centuries seemed rather mundane, rather human, compared to the Macy’s version. The point is worth considering. Before doing so, we must say a word about ‘Myth.’ In modern parlance, the purpose of calling something a ‘myth’ is to make it clear that the thing in question is not true. You’ve surely heard it said, “That’s only a myth…” This is unfortunate, because the word’s older usage is more helpful in explaining the phenomena discussed in this essay. The television show MythBusters comes nearer to getting it right. In this show, various popular beliefs in society are actually put to the test. Yes, some of the beliefs do not survive their testing. However, some of the beliefs are shown to be plausible or even confirmed. In other words, on this view, a myth is not necessarily true or false, rather, it is a story that is believed to be true by some people. These are all ripe lines of inquiry for the truly inquisitive—but the modern concept shuts down inquiry at the beginning, suggesting subliminally that the matter has already been settled by someone else as false. It rarely occurs to anyone that this someone might have himself been wrong in his conclusions, or worse, this someone merely dismissed the account with smug hand-waving. One sees this sort of smugness wherever ‘myths’ are discussed, and the Story of Santa Claus provides the base for much of the hand-waving, along with that unfortunate fellow, the Easter Bunny. After all, isn’t it always said that people grow out of their beliefs about Santa Claus and the Easter Bunny? Believing such things as a child is alright, but once you are an adult, you know better! You believed in X as a child, but now that you are an adult, set aside your belief about X, just as you now know the truth about Santa Claus! As it happens, I am a Christian. I have a particular passion: explaining and showing to people that Christianity is actually true. There are a great many Christians who are quite prepared to jump in with the materialists and rip on the Santa Claus Myth, with the difference being that Christians believe the commercialization of Christmas represents a society-wide forgetting of the ‘Reason for the Season.’ I do not agree with either of those perspectives, as usually argued. First, let me speak to the Christians. In the first place, I take issue with the notion of ‘society-wide’ being a proper focal point for Christian advocacy. If you and your family do not forget the ‘Reason for the Season’ and your Christian friends do not forget, and your church does not forget, I fail to see the problem. We could get ‘society’ to adopt every behavior that Christians approve of, but that would not make ‘society’ Christian, per se. It might, rather, make ‘society’ a ‘white-washed tomb,’ instead. If you have a concern about the commercialization of Christmas, it is only to yourself and your fellow Christians that you have any responsibilities. After all, if they aren’t Christian, the mere knowing what the ‘Reason for the Season’ isn’t going to change anything. If they don’t know the ‘Reason for the Season’ that is the least of their problems, and de-commercializing Christmas is not likely to help. And, well, it’s not likely to happen, either. In the second place, there surely must be something to be said about the fact that the world’s greatest party is thrown, every year, with the celebration of the birth of Christ as the cornerstone, by Christians and non-Christians alike. No such parties are held in honor of Hanukah of the Fourth of July or Ramadan. Oh, sure, Jews around the world celebrate Hanukah. But do non-Jews? Yes, the Fourth of July is a popular American holiday. But is it celebrated in China? Ramadan is observed by millions of Muslims. Do non-Muslim children eagerly look forward to the arrival of Ramadan each year? But wherever Christmas goes, it is lapped up gleefully. There are places today where Christmas isn’t celebrated, but that is only because Christmas hasn’t yet reached it. The Christmas phenomena strongly suggests that there is something about it that resonates with people. This ‘something’ represents an opportunity for Christians. Identify the ‘something’ and harness it as a means for preaching the Gospel, for it is the one occasion when non-Christians draw themselves closer to Christ. And they do this every year! Without coercion, legislative, social, or otherwise. Amazing. To the materialist I would take this point and submit it as evidence that, despite their protestations, humanity is not just a “fortuitous concurrence of atoms.” The materialist outlook does not satisfy, and its failure to satisfy is itself evidence of its deficiency in explaining the world. I need not limit myself to Christmas to make that point. Whether it is the existence of religious fervor among the great majority of humans, or even the widespread superstitions and enjoyment of ‘ghost stories,’ the fact is that most people know that the materialist viewpoint does not obtain, even if they can’t express why in a syllogism. Yet it is at Christmas, in the West, at least, where the materialists themselves abandon their philosophy and join in the party. The great tendency of humanity to party is itself a testimony to the defect of materialism. Have you ever seen a pack of coyotes celebrate a birth day? Do apes bake wedding cakes? But it can be said that nonetheless, it must all be an illusion, or perhaps a neurological ‘misfire,’ since (the materialist says) the Santa Myth shows how people can believe something that is not true at all. Ah, but there is the rub. It is not true that it is not true at all. Indeed, there is not much that people believe that is not true at all. There may be accretions, and it may not always be possible to know which is the fundamental reality and what is the accretion, but more often than not, the existence of a fundamental reality can be discerned. This is not a blow to Christianity, which contains within it the ability to interpret these fundamental realities in a way consistent with the Christian worldview. It is a blow to materialism, which, by definition, must reject anything non-material. In the case of the Santa Myth, it so happens that it is possible to peel back many of the accretions and get a glimpse of the fundamental reality. One of those accretions you hold in your hands—Moore’s A Visit from Saint Nicholas. 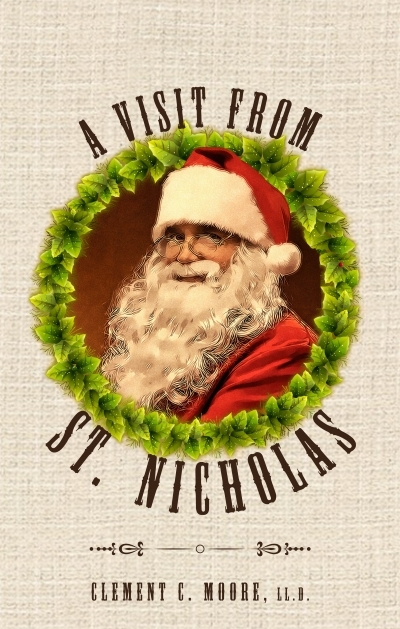 The fundamental reality is that there really was a Saint Nicholas. He was a Christian bishop who lived around 300 AD. He suffered grievously at the hands of the Roman emperor Diocletian. After suffering so much, he was not sympathetic to those, like Arius, who insisted that Nicholas had suffered only for a man, not God incarnate. There is a legend that St. Nicholas punched Arius in the face at the Council of Nicaea (325 AD). How is that for ‘jolly Saint Nick’? Surely the reader sees how ‘Saint Nicholas’ and ‘Sinterklaas’ and ‘Santa Klaus’ are a reference to the same person? Yes, accretions do exist. But nonetheless, the evidence is that there was a man, Nicholas of Myra, who did exist. While we may not know very well the true reasons for why he became so popular throughout the Roman empire, the popularity itself is evidence that he did something that was perceived as out of the ordinary. The accretions, also, are evidence of the same. Those who say that the ‘Santa Myth’ is a good example of what we ought to do in regards to Jesus of Nazareth have badly misunderstood their own position. In reality, doing with Jesus what we do with Santa threatens to expose the fact that just as we can establish that Nicholas was a real person in history, despite certain ambiguities, we can also establish that Jesus was a real person in history—despite certain ambiguities. But Jesus’ resurrection from the dead, upon closer, unbiased inspection, does not appear to be one of those ambiguities.